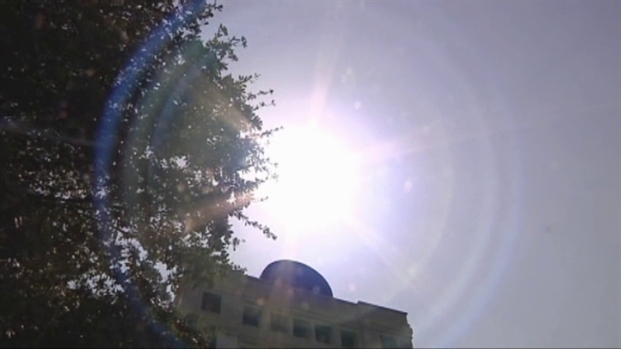 Temperatures in Fort Worth on Thursday may not have hit triple digits, but the danger the sun and high temperatures possess continues. Health and government officials want to educate the public about the danger of heat to children who are left or find their way into cars. So far in 2011, 22 children have died from hyperthermia and heat stroke from being in hot car. Last year there were 49 deaths according to the National Highway Traffic Safety Administration. Temperatures don't have to hold near records of 110 to lead to cars hit enough for a tradgedy to happen. The NHTSA said outside temperatures of just 80 degrees can heat up the inside of a car to 123 degrees in just an hour. In an attempt to slow a growing trend, local health and public officials talked about the dangers of leaving children in hot cars Thursday morning. Tiffany Hayes knows the consequences all too well. The day after Labor Day in 2005, she lost her two-year-old son Riley after he sneaked into her car and locked himself in. She spoke with officials at Cook Children's on Thursday morning. "Riley had gotten out of the window and in the car and locked himself in my car while I was taking a nap," Hayes said. "I didn't even know that could happen." Riley and his three-year-old brother Tristan were both down for naps. Hayes had been taught to nap while they slept and while she had child proofed her home, she didn't lock her car. The outside temperature in Tyler, where she lived, was in the high '90s. What made matters worse was that days later she learned several neighborhood children had seen Riley struggling in the car. That fact led her to speak about her son's death for the first time -- to help others. "Educate your family, your nieces, your nephews," said Hayes. "They're the ones who are going to be outside and notice it. That's the one thing can could have saved Riley, was the kids that saw him but didn't know." Texas often leads the nation with children left in cars deaths. Terri Ford of Safe Kids Tarrant County said it can happen whenever there is direct sun light and heat. "When the temperature does come down, eventually, into the 90's and 80's it's still an issue," said Ford. "The car still heats up, we still have a lot of sunshine in our state and so it's something we want to continue to be diligent about." Both Ford and Hayes say its a completely preventable death. And while it's understandably still painful for Hayes to talk about, she said it's worth it. "My hope is that his short life, will save a child," said Hayes. "My hope is that his story will prevent another child from dying like that." For more information and tips click here.